• Recommended for outdoor use• Avaliable in 2 sizes• 5 1/2-foot steel wrapped cord• Keeps water from freezing even in sub zero temperatures• MET Listed• 1 year warranty• Now available in stainless steel. A big 96 ounce and a whopping 1.5‐gallon Thermal‐Bowl makes water available for pets in even the most extreme cold temperatures. 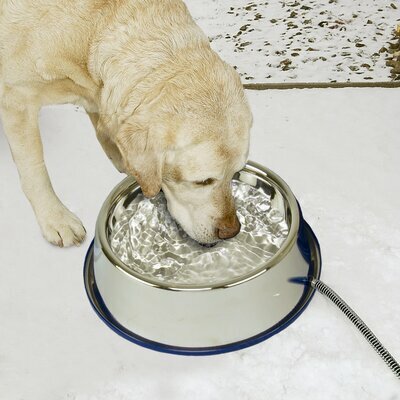 Thermostatically controlled Thermal‐Bowl is the answer to freezing water bowls. Just plug it in and your petʹs water will remain open all winter. All electronics are safely sealed inside and the cord is steel wrapped to prevent abrasion. The 96 ounce comes in blue, and the 1.5‐gallon is available in gray granite color. These bowls are only 25 watts for extremely low energy consumption. One year limited warranty. The ever popular K&H Thermal Bowl is now available in stainless steel. The stainless steel construction will not harbor bacteria, does not stain, will not absorb smells, and is easy to clean and disinfect. This 120-ounce, heated bowl uses only 25 watts to keep water from freezing even at sub-zero temperatures. MET listed. One year warranty. No more frozen food and water! Outdoor cats can now enjoy fresh wet food and drinking water, even in sub-freezing temperatures. The easy to remove stainless steel bowls are dishwasher safe. Both sides of the unit can be used for food, water or one of each. MET listed. One year limited warranty.